Illicit drugs and crime are roadblocks to the rule of law and democracy, a United Nations official said today, urging countries to collaborate to address this threat to stability and development. “In so many ways, illicit drugs and crime and development are bound to each other. If countries are denied the rule of law and justice, development is jeopardised, and societies weakened by the lack of sustainable development can become the staging areas for the criminal networks,” said the Executive Director of the UN Office on Drugs and Crimes (UNODC), Yury Fedotov, at the opening of the 56th Session of the Commission on Narcotic Drugs (CND) in Vienna. During the five-day session, more than 1,000 representatives from Member States and civil society, will discuss issues ranging from international cooperation in combating drugs to public health and safety concerns, including the threat of new psychoactive substances. Mr. Fedotov noted that, in recent decades, the production and consumption of cocaine has declined and the majority of opium cultivation and production is localized mainly in Afghanistan. However, he added that these trends were offset by the rise of synthetic drugs, as well as new psychoactive substances. “The overall prevalence of drug use is not decreasing. Illicit drugs kill more than 500 men, women and even children every day,” he said, adding that UNODC is working hard to respond to these issues by introducing regional and country programmes that deliver assistance where it is needed, building strong partnerships and promoting political commitment at the highest international levels. Providing alternatives to suppliers is also crucial, Mr. Fedotov said, stressing that there can be no successful eradication without complementary alternative development projects for farmers. The response must also focus on the demand side, he said, calling for a balanced approach to deliver real solutions to those in need and to reduce the health and social consequences of drug abuse. UNODC is working in the spirit of the drug conventions to deliver results in the areas of prevention, treatment, rehabilitation and social reintegration, Mr. Fedotov said. “Building synergies between our approaches to law, health and alternative development is a necessity. All of these activities must also be reinforced by a sense of shared responsibility, which we should never allow to be weakened,” he added. This year’s CND session precedes a high-level review of the implementation of the Political Declaration and Plan of Action on International Cooperation towards an Integrated and Balanced Strategy to Counter the World Drug Problem in 2014, which will be followed by a Special Session of the UN General Assembly on the drug problem in 2016. 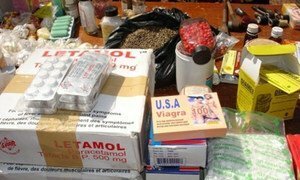 The independent United Nations body tasked with monitoring the production and consumption of narcotics worldwide today warned of the increase in use of psychoactive substances known as 'legal highs' which reproduce the effect of illegal drugs, and represent a threat to public health.